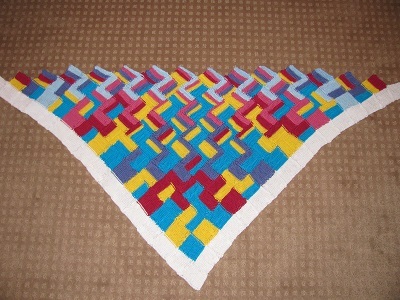 I finished my Pascal’s Triangle Shawl! I’m very happy with how it turned out! In fact, I was disappointed by how the top edge curled — until I wore it, and it forms into a sort of collar! Perfect! I already explained the math behind the shawl in great detail. So now I’ll just say that this is a color-coded representation of Pascal’s Triangle, with a color for each prime factor, and each number represented in a diamond with its prime factorization shown. In Pascal’s Triangle (at least when it’s shown with the point down, as above), each number is the sum of the two numbers beneath it, with 1 on all the ends. So 1 is white in my shawl. I took it up to the 15th row. After that, entries had more than 6 factors, so it wouldn’t be as easy to get them all in. Take a moment to enjoy the flow. 🙂 Each time we get to a prime, every number in that row has that prime as a factor. But it won’t be the last! As I began the shawl, I wasn’t sure it wasn’t a bit too garish with all the bright colors right next to each other. At least in the prime factorization blanket, I had rows of white in between the numbers. Though now that it’s finished, I completely love it. Anyway, I decided to make a second one — this time using shades of pink and purple, with only subtle differences, going from light to dark. The first one will be easier to use for explaining the math, but I think the second one may be prettier. And last night, I got another idea about how to make the second one different. Instead of having blocks of color for each factor, I’m planning to alternate rows. I think that will blend the colors as you look at the shawl — and I think it will be very beautiful! Stay tuned! This entry was posted on Thursday, February 13th, 2014 at 11:03 pm and is filed under Knitting, Mathematical, Prime Factorization. You can follow any responses to this entry through the RSS 2.0 feed. You can leave a response, or trackback from your own site.